Where do I use my Oak Furniture Superstore voucher code? Follow our link to the Oak Furniture Superstore website and browse for your goods. Choose your size and click ‘Buy Now’. Paste the promo code you’ve copied in the box beneath your order and click ‘Apply’. Once your savings have been deducted from your overall total click ‘Checkout Now’ to complete your purchase. Alternatively, you can present your code at checkout in-store if applicable. "0% interest-free credit on your purchase." 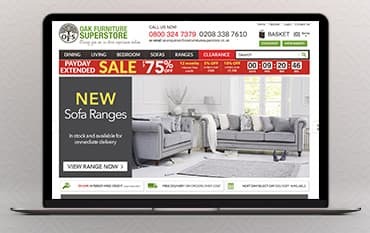 The Oak Furniture Superstore is a well-established family-run business with 50 years proven experience in offering shoppers quality home furniture at affordable prices. Using an Oak Furniture Superstore discount code, you’ll receive excellent bargains on their impressive selection of quality oak furniture for the dining room, bedroom and living room alike. When you combine the free two-man white-glove delivery on all orders over £350 and the seven-day money-back guarantee with our Oak Furniture Superstore voucher codes, you’ll be able to dress your home with high-quality furniture at the lowest possible prices. For the latest special offers and Oak Furniture Superstore discount codes, take a look at our details page before you place any orders to make sure you’re not missing out on a deal you’ll love. You won't often find a discount code on offer from Oak Furniture Superstore. However, there are still lots of ways that you can save money on your furniture. Discover massive discounts on their limited stock clearance furniture range including dining sets, sideboards, coffee tables, bedside tables and more. The website also has lots of flash sales offering discounts of up to 75% on select furniture. Netvouchercodes will keep you updated on all the latest codes, clearance sales and offers, so can give your home an update for a bargain price. If a new dining table is what you need then look no further than oak Furniture Superstore. They offer an extensive choice of dining tables to suit every need and complement all types of décor. Whether it's a cosy table for two that you need or a table that extends to accommodate the whole family, you'll be spoilt for choice at Oak Furniture Superstore. Choose from a variety of modern or traditional styles in glass, oak, metal, pine, hardwood, high gloss, marble and more. You are sure to find something here to suit your home and your budget. At Oak Furniture Superstore you'll find a great selection of beds on offer, in styles to suit any type of bedroom decor, and designed to ensure that you sleep in style as well as comfort. They come in a range of sizes from single to super king with everything in between. Choose from bedstead in oak, hardwood, metal, leather or high gloss or fabric, with low foot ends, high foot ends or ottoman styles. You'll also find a choice of bunk beds, suitable for children's rooms or smaller bedrooms. All of these come with amazing price tags too without compromising on quality so check them out now. Yes. You have 14 days to return your order if you are unsatisfied with it. To be eligible for credit you must: be aged between 18 and 75, be a permanent UK resident and have lived at your address for longer than one year, have a debit or credit card and have a valid UK telephone number. Oak Furniture Superstore stock high-quality oak furniture for every room in your home. They offer a huge choice of Dining Tables and Chairs, Sideboards, Coffee Tables, Wardrobes, Bed Frames, Dressing Tables, TV Units and more. Whether you prefer your furniture in a dark wood colour, cream or maybe a more modern wood and metal look, Oak Furniture Superstore are bound to have the perfect piece for you. Use one of our Oak Furniture Superstore discount codes and save on your next piece of furniture.